OneCare CEO Todd Moore addresses reporters Wednesday with Gov. Phil Scott to his right. Vermont has started a one-year program to pay a network of health care providers a lump sum to care for 30,000 Medicaid patients. The pilot program could determine whether the state adopts an all-payer system, in which health care providers are paid based on the quality of care they provide rather than the quantity of services. 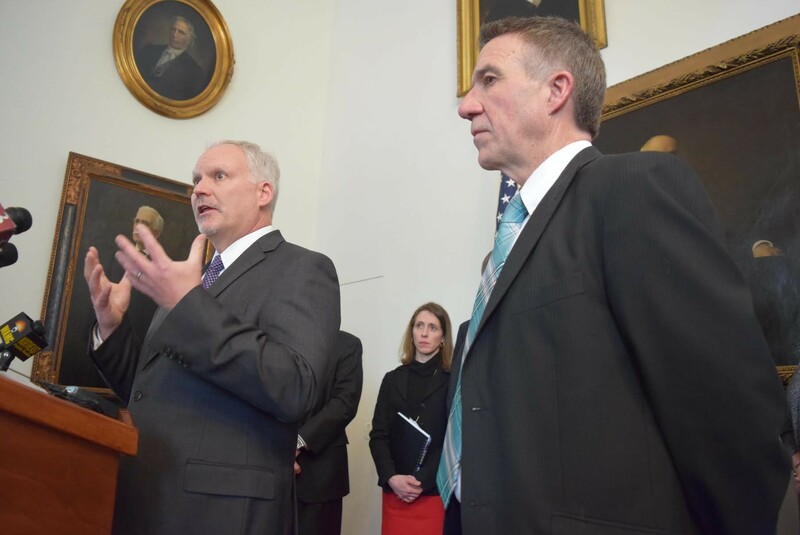 Scott’s predecessor, Peter Shumlin, received permission from the federal government last year to implement an all-payer model, and selected OneCare last June to try out the model with Medicaid patients. The accountable-care organization consists of several hospitals, including the University of Vermont Medical Center, as well as independent practices and other health centers. During the one-year period, the state will pay $93 million to OneCare’s network of approximately 2,000 providers to care for 30,000 patients. If it costs more, OneCare picks up the tab, and if it costs less, OneCare recoups the savings — but only to a point. If OneCare spends or saves more than 3 percent, the state steps in to pay the additional money or collect the savings. Currently, the state spends about $1.7 billion on 151,000 Medicaid patients. Providers in the OneCare network are already caring for the patients in the pilot program and, according to UVM Medical Center CEO John Brumsted, “They won’t see any difference in how their care is delivered.” He noted that patients will still be able to challenge a treatment decision by filing a grievance.